Noted by The New York Times for giving "the proceedings an invaluable central thread of integrity and stylishness," violinist Ariana Kim made her New York recital debut at Carnegie's Weill Hall in 2008 and is now in her fifth year as a professor at Cornell University. At 16, Ariana made her debut with the St. Paul Chamber Orchestra and at 24 was appointed acting concertmaster of the Louisiana Philharmonic in New Orleans; she has since become one of the most respected artists of her generation. An avid chamber musician of both the contemporary and traditional literature, Ariana recently completed a 10-year position with the contemporary music septet Ne(x)tworks, is currently in her 10th season with The Knights. The Knights recently released their seventh album, ...the ground beneath our feet... on which she is a featured soloist alongside Guillaume Pirard in Steve Reich's Duet, which was chosen as one of NPR's "Songs We Love" for 2015. She will also soon begin her 12th season as a core member of the Chamber Music Society of Minnesota where recent collaborators have included Leon Fleisher, Charles Neidich, Nobuko Imai, and Peter Wiley. 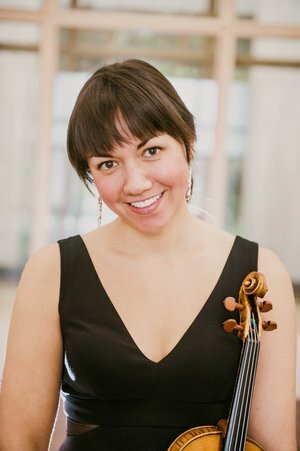 She has spent summers attending Yellow Barn and the Ravinia Festival Steans Institute and now serves on the faculty of the Crowden Center Chamber Music Workshop, the Palo Alto Chamber Music Workshop (CA) and the Northern Lights Chamber Music Institute (MN). Currently Ariana co-resides in Ithaca and New York City where she completed her Doctor of Musical Arts degree at Juilliard under the tutelage of Robert Mann. In December 2015, she released her debut solo album, Routes of Evanescence: Music for Solo Violin & Violin + 1 by American Women Composers. She recently spent seven months living and working in Italy where projects included solo recital tours, private teaching and lecture presentations, period opera performances with Milano Classica, and a capstone project involving art, architecture, music, and humanitarianism with the non-profit refugee cooperative, Cooperativa Selene.